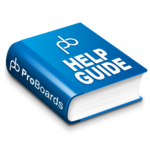 The Support Board offers live technical help for ProBoards forums. On the Support Board forum owners and members can post questions regarding all areas of forum functionality. ProBoards Admins* are online Monday through Friday from 9am-5pm PST/PDT (with the exception of some US holidays). In addition to the staff, there are designated Helpful Members and other experienced members who volunteer their time assisting on the Support Board by posting solutions or clarification requests 24/7. Please show these members the same respect you would a ProBoards' Admin*. The Support Board is designed for ProBoards free forum platform. Users of ProBoards paid service, Forums.net should use the specially designed ticketing system accessible through the Forums.net Dashboard. The Support Board is governed by the Rules of the Support Forum, the board's Posting Guidelines as well as the TOS which includes the Community Guidelines. *Admins are staff of ProBoards, Inc. They are also fondly referred to as "reds" due to their red name and star ranking as shown in their profile.